20:30 Behold, two blind men sitting by the road, when they heard that Jesus was passing by, cried out, "Lord, have mercy on us, you son of David!" 20:31 The multitude rebuked them, telling them that they should be quiet, but they cried out even more, "Lord, have mercy on us, you son of David!" and asked, "What do you want me to do for you?" 20:33 They told him, "Lord, that our eyes may be opened." 20:34 Jesus, being moved with compassion, touched their eyes; and immediately their eyes received their sight, and they followed him. 10:46 They came to Jericho. As he went out from Jericho, with his disciples and a great multitude, the son of Timaeus, Bartimaeus, a blind beggar, was sitting by the road. 10:47 When he heard that it was Jesus the Nazarene, he began to cry out, and say, "Jesus, you son of David, have mercy on me!" 10:48 Many rebuked him, that he should be quiet, but he cried out much more, "You son of David, have mercy on me!" 10:49 Jesus stood still, and said, "Call him." 10:51 Jesus asked him, "What do you want me to do for you?" 10:52 Jesus said to him, "Go your way. Your faith has made you well." Immediately he received his sight, and followed Jesus in the way. 18:35 It happened, as he came near Jericho, a certain blind man sat by the road, begging. 18:36 Hearing a multitude going by, he asked what this meant. 18:37 They told him that Jesus of Nazareth was passing by. 18:38 He cried out, "Jesus, you son of David, have mercy on me!" 18:39 Those who led the way rebuked him, that he should be quiet; but he cried out all the more, "You son of David, have mercy on me!" 18:40 Standing still, Jesus commanded him to be brought to him. When he had come near, he asked him, 18:41 "What do you want me to do?" Matthew and Mark say Jesus and the twelve were leaving Jericho when this incident occurred, while Luke says Jesus was coming near to Jericho. Many commentators suggest that Matthew and Mark refer to the old city of Jericho, while Luke refers to the adjacent new city. 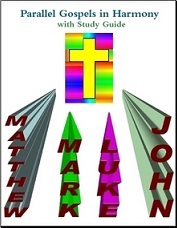 Matthew tells of two blind men, but Mark and Luke apparently mention only the more noteworthy of the two.